Semi-Recessed Waste Receptacle has a capacity of 12 gal (46 liters). 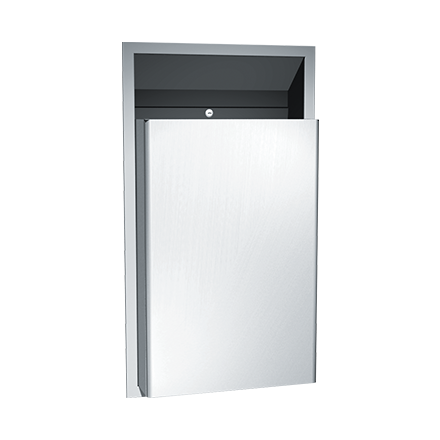 Frame, waste receptacle and cabinet are fabricated of 22 gauge stainless steel alloy 18-8, type 304. Waste receptacle has hemmed edges for safety and internal hooks for hanging a reusable vinyl bag (optional, supplied separately, model 58-PY for 12 gal). A tumbler lock keyed retains waste receptacle. Container locks into cabinet, removable for servicing.